Powered by the Kontakt 5 Player, and featuring completely new content, this 2 GB collection provides a “music-meets-sound-design” approach for the modern composer. EVOLVE MUTATIONS is a go-to resource for hybrid, electronic, pop and dance music productions, either on it’s own or as an addition to Heavyocity’s flagship Virtual Instrument, EVOLVE. Find your sonic signature with EVOLVE MUTATIONS. Organized into four categories, this unique sonic resource includes an arsenal of highly expressive instruments, rhythms, and ambiences that can add depth and impact to any dramatic production. EVOLVE MUTATIONS is powered by the NI Kontakt engine. It is fully integrated into the Kontakt 5 player, and has an intuitive user interface. Users are provided with control over ADSR, HIGH PASS FILTER (including cut-off and resonance), LOW PASS FILTER (including cut-off and resonance), and EFFECTS (including Skreamer, Lo-Fi, Reverb, and Delay). Through the Kontakt interface, users also have control of Tuning, Pan, and volume. The sound of Evolve Mutations comes from Rhythmic Suites, loops, kits, and effects, all powered by the Kontakt 5 (Player) engine. All loops and kits are designed for seamless layering and maximum flexibility, and loosely classified in four styles: Epic Organic, Epic Tech, Industrial Electronic, and Mangled Pop. Massive crunchy beats, walls of tweaked percussion, and next-gen tonal elements make up the Rhythmic Suite categories. The percussive loops are broken down into slices and mapped into individual presets allowing the user to rearrange and create their own loops. Ranging from twisted drum kits to unique impacts, this category puts a variety of percussive sounds at your fingertips. 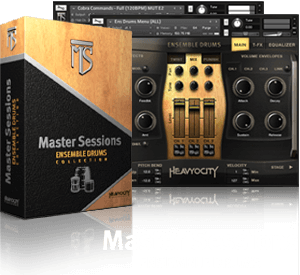 Made up of 5 different menu-style kits, the Percussive Kits are best used as one-off hits or as elements to build your own beats. Offering distinct new ways to heighten emotional impact, this category is perfect for adding terrifying or serene punctuation to a film soundtrack or unique textures to the breakdown of a song. The category is comprised of several menus in addition to the associated sounds mapped onto individual presets. A mashed up array of instruments that stray from the traditional “meat and potatoes” sounds that many composers already have. From organic, otherworldly soundscapes to gnarled-out synths, to treated melodic instruments, these sounds will bring an innovative quality to your arrangements. 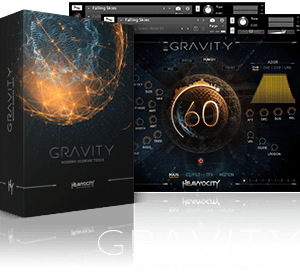 Developed by Heavyocity’s critically acclaimed team of professional composers and sound designers (Interstellar, Gone Girl, Godzilla), GRAVITY covers the gamut of intangible scoring elements; complex Pads, evocative Risers, other-worldly Stings, and earth-shattering Hits.